30% OFF! 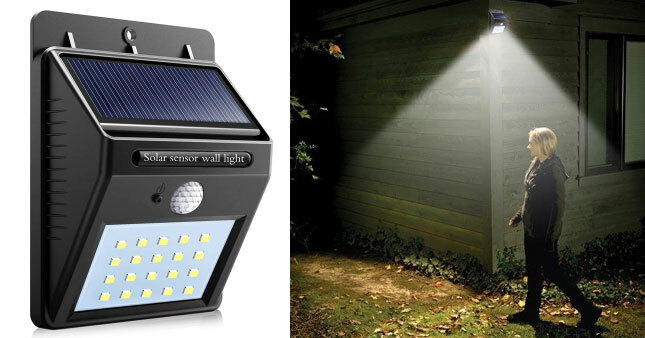 20 LED Solar Powred Motion Sensor Activated Outdoor Waterproof Wall Light worth Rs. 1,800 for just Rs. 1,250! Motion Sensor. Integrated the design of PIR motion sensor and night sensor, it will auto turn on and off light when in darkness or at night, and auto turn off when in daytime or bright area. It will enter into high light mode when people come and stay for 30s after motion stops and then turn to off light to save energy. High Performance. It uses polysilicon solar panel whose light conversion efficiency is up to 17%. Waterproof, freeze-protection and sun block design offers you durability. External waterproof switch, instead of pinhole switch, makes operation easily. it only needs 8hours to be fully charged and can last for 12hours working time. Let the solar panel get enough sunshine during the day and it will turn on automatically at night to act as a security light. Three (03) month warranty against manufacturing defects.